Can Tho is 170 km from Saigon. Since the beginning, Can Tho was already given the title Tay Do or Western Capital. It is also the meeting point of the various waterways of the Mekong Delta. Today, it has become an industrious city with big bottling companies and fish sauce factories. It is is home to 220,000 inhabitants Can Tho is a busy port capable of accomodating large ships from neighbouring countries. Hau Giang or Hau River is the main channel that passes through Can Tho city. The land mass surrounding the river was developed very early so the population in this area is probably the largest in all of the Delta region. The land here is said to be the most fertile because of the deposits from the various branches of the river. As a regional hub, it is easy to get to Can Tho city from cities in the Mekong Delta. There are bus operators from all big cities and minibuses from smaller ones. If you arrive from Cambodia, you will probably stop in Chau Duc and catch a bus to Can Tho here. There is also one bus line directly from Phnom Penh once a day. It is difficult, not to say impossible, to get in by car from Cambodia as a tourist. You should also check, if you want to enter Vietnam by bicycle or motorbike. A new airport services Can Tho. Currently flight destinations are limited, but as the city grows more destinations are planned. From Ha Tien (Cambodian border): There are multiple daily buses that take 6 hours to Can Tho from Ha Tien departing from the large bus station on the other side of the river from the main downtown area. Many operators serve Can Tho from cities in the Mekong Delta up to the center and north of Vietnam. You may have a short stop in Ho Chi Minh City. Most travelers arrive in Can Tho from Ho Chi Minh City. From Ho Chi Minh City bus operators servicing Can Tho are leaving every one to two hours around the clock from the Western Bus Station (Bến Xe Miền Tây). Prices are US$4-7. Smaller more local buses from Saigon to Can Tho leave in the morning. There are three main operators servicing routes from Ho Chi Minh City as well as other destinations – “Thanh Buoi”, “Phuong Trang” and “Mailinh”. The big operators also have a departure point in the center of the city at Le Hong Phong street, from where shuttle buses will bring you to Bến Xe Miền Tây. You can take a taxi to Le Hong Phong street in district 10. Look out for the office of “Thanh Buoi” (white background logo with a flower), “Phuong Trang” (red signs) or “Mailinh” (all green) or go straight to Mien Tay bus station in district 6. The taxi from district 1 costs around US$15 in August 2013. With most operators you will get a small bottle of water included in your ticket price. Bigger buses offer AC, but also entertainment program of Vietnamese films and music shows, which are usually perceived as too loud for “Western ears”. By car, allow about 1.5 hours from Sóc Trăng, about 3 hours from Châu Đốc, about 3.5 hours from Rạch Giá, less than 4 hours from Ho Chi Minh City (169 km), about 6 hours from Cà Mau and about 1.5 hours from Long Xuyen. It is possible to rent a car for US$140-180 for a one-way trip (or return trip in the same day) for 2-3 passengers from Ho Chi Minh City to Can Tho. A driver is included in the price. In case you want to drive yourself, you should check well in advance about the conditions. You might be slightly faster by motorbike than by car depending on your way of driving. It is quite easy to rent a motorbike in the tourist area in Ho Chi Minh City district 1. Most rental stores will rent a motorbike to you, if you can show a driving license of any country or will even not ask for a license at all. Beware that you are only covered by your insurance in case of an accident, if your driving license is valid in Vietnam. Most European licenses are not automatically accepted. You might need to take an additional test with Vietnamese authorities in order to comply with the local rules. It is also possible to rent a taxi for about almost the same price as a car for 1 way from Ho Chi Minh City to Can Tho. Try hiring a Vinasun Taxi or Mailinh taxi. Apart from overnight boat cruises for tourists, there are not anymore regular boat transportation services to Can Tho. 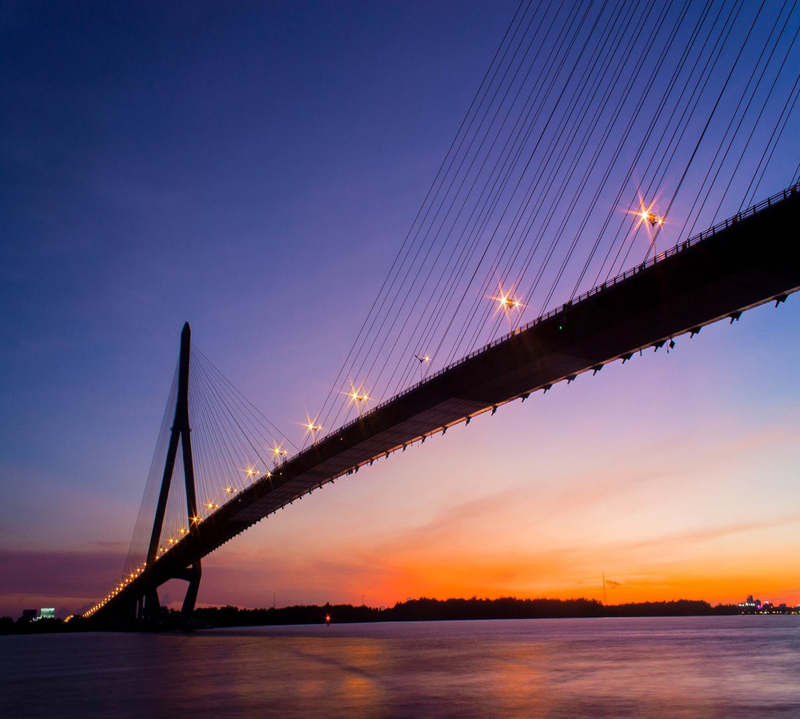 This is due to the fact that the time for driving to Can Tho has been reduced to less than 4 hours with the opening of the Can Tho bridge in 2011 and the finalization of the motorway around HCMC. Trà Nóc Airport now has a vast international terminal with convenient facilities. As of 2011, the airport is connected to Hanoi, Phu Quoc with flights on Vietnam Airlines and Con Dao with flights on Mekong Air. The airport is also connected to Da Nang with a daily flight on VietJet (10:00am – 11:30am) as of May 2016.